Brian did a wonderful job sharing his love of San Francisco. We enjoyed wonderful Chinese food and the Tea stop was great. Pizza, wine, canolli and fudge were perfect. You will not walk away hungry. The information on the tour states it lasts 2 hours. Ours lasted around 4 1/2 hours, so make sure that works with your time frame. It was great. Thanks so much! Doing the Chinatown North Beach food tour the first evening in San Francisco was a fun, informative way to experience the city! Me and my husband had a great time! This was our first Food tour and what a way to start. We are addicted now! All thanks to Brian.very knowledgeable and fun! We had a great time on this tour with Brian. He was so enthusiastic about his city and the food. We covered so much. Food sampling was diverse,delicious and plentiful. None of the stops felt rushed . The tour wound up being much longer than the two hours..so just be mindful when booking if time is a factor. Such a fun, yummy, and entertaining tour with Brian! We learned a lot and loved the food stops! 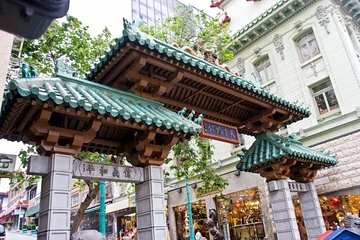 I really enjoyed the group walking tour of Chinatown and North Beach! Our guide was very nice and knowledgeable, we had a great group, and lots of tasty treats! A great way to see and taste some of San Francisco's offerings! Great evening. Ilene was knowledgeable and prepared It was raining cats and dogs and she came with extra umbrellas. The various foods that we sampled were great. As others have noted, there was lots of food. Ilene recommended that we pack up our extra Dim Sum for breakfast which we did. With all of the things to see and do and stories to hear, this pretty much filled the evening. the tour guide was very knowledgeable. Highly recommended! Great guide and a great mix of culture and history! Only concern was that we had taken the Alcatrez Tour that morning, so were a bit worn out after doing 2 tours. We could have probably had more fun if the tour had been shorter or perhaps focused on just the highlights or those areas we were more interested in.